Requested from DOST-STII by Gregg Jones Galgo at 02:20 PM on Nov 05, 2018. Purpose: Research for academic purpose only. 1. for the PDF copy of: "The Proceedings of the Constitutional Convention 1934-1935" (all volumes) posted in your online database. I checked the link you provided. However, only one (1) pdf file is downloadable. There are other pdf files that can't de downloaded since it requires log-in from STII. There are seven volumes in the Proceedings but the accesible pdf is only volume one. Thus, I would like to request copy of the other volumes of the proceedings' pdf. Please see attached image for further clarification. Thank you for your request dated Nov 05, 2018 under Executive Order No. 2 (s. 2016) on Freedom of Information in the Executive Branch, for Request for a review and pdf copy. We received your request on Nov 05, 2018 and will respond on or before Nov 26, 2018 02:20:50 PM, in accordance with the Executive Order's implementing rules and regulations. Should you have any questions regarding your request, kindly contact me using the reply function on the eFOI portal at https://pcoomaster07262017140000-dot-efoi-ph.appspot.com/requests/aglzfmVmb2ktcGhyHgsSB0NvbnRlbnQiEVNUSUktMzc0ODMzMTM5NzIwDA, for request with ticket number #STII-374833139720. Thank you for your request dated Nov 05, 2018 02:20:50 PM under Executive Order No. 2 (s. 2016) on Freedom of Information in the Executive Branch. You asked for Request for a review and pdf copy. All the PDF Files are now available for download, kindly revisit the website. 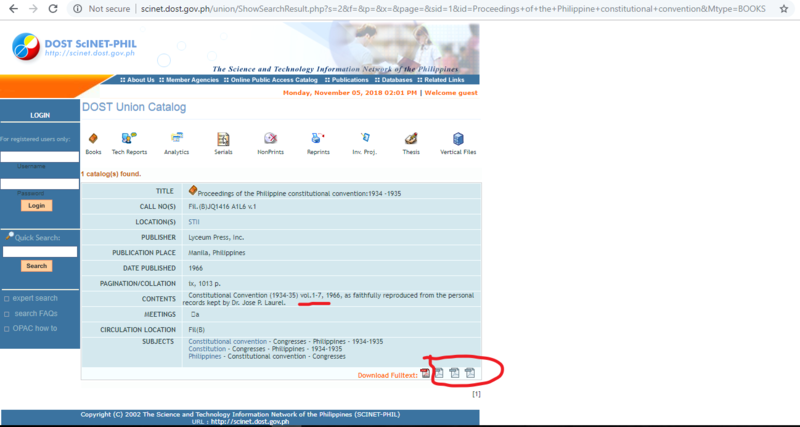 Feel free to browse scinet.dost.gov.ph for other references. If you are unhappy with this response to your FOI request, you may ask us to carry out an internal review of the response by writing to Secretary Fortunato T. de la Peña, DOST Building, Gen. Santos Avenue Bicutan, Taguig City Metro Manila 1631 Philippines. Your review request should explain why you are dissatisfied with this response, and should be made within 15 calendar days from the date when you received this letter. We will complete the review and tell you the result within 30 calendar days from the date when we receive your review request.